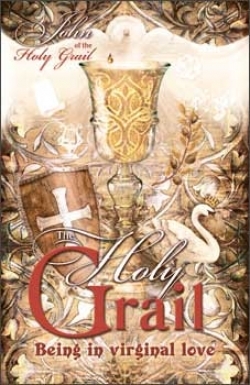 From the book "THE HOLY GRAIL – BEING IN VIRGINAL LOVE"
If God gave me liturgies and hours adapted to the Holy Being1 of the Grail, I would rewrite many of my old books and scrolls which are already covered with a layer of dust. I would do it to strengthen their spiritual fragrance. Books which correspond to the heavenly scrolls begin to emanate their spiritual fragrance straight away. Any other book, no matter how well it is written, or how many copies are printed and categorised as ‘best-seller’, is not worth the paper it is printed on. Its yellowing pages will gather dust and disappear into insignificance, leaving no trace of either the author (he is probably in a state of sin for having seduced a million readers), or the reader. One day they will say to him, ‘It died a mortal death.’ It is a mirage. It is nothing at all. What attracted me to the manuscript (cryptogram) about the religion of the Grail? It is good for a person to know that the Other Church exists, so that his search may one day be rewarded with the cherished goal. So that he finds the truth. It is not in a Lutheran kirkko somewhere on the outskirts of Helsinki, nor in an Orthodox chapel with its beloved ritual nonsense and operatic-sounding rites from the time of Monteverdi and Verdi, but in the True, radiant and transfiguring Church, where a person can one day unearth a pearl of the Holy Being. Then the trace of immortality and the infinite potential bestowed on him by the Most High will be revealed. 1 The Holy Being – in Russian: ‘пакибытие’ [pakibytie].